Feel my Sunlight: Moses doesn't want you for a sunbeam. This week has been wonderful! Second of all I need to let y'all know about letters! So, because of several circumstances (transfers, Christmas, etc.) We have been asked to have you send all letters to the mission office and not to my apartment. Packages may be sent to my apartment address if necessary, but I would be careful because there is a chance I could get transferred next week and it would be a total bummer if I were to not get anything you send. You can find that address on my blog (feelmysunlight.blogspot.com) or by contacting my mom. Good. Now let's talk about fun stuff! My week this week has been really good. I can't believe I'm already 6 weeks into my mission. It is actually very reassuring to know that I can do this work and to see how much I've grown in the last six weeks! My mom asked me a bunch of questions that I thought would be fun to answer so here it goes! My gators are still good. Willy is my favorite (don't tell the others) He cut his dreads this week so he can come to church and he is also working on quitting smoking and he is just so great and his so committed to the gospel. We also have Julia who I love! As well as Louis and David who are plugging along. And Kristy is still having health problems so keep her in your prayers as we haven't been able to see her or her girls in a few weeks. We also have several other awesome investigators but this email would go on forever if I talked about all of them. Church outside of Utah is pretty fun. Almost nobody is native to Florida and just about everybody is a convert so there are a lot of really cool back stories we get to hear about people’s lives. I feel close to the ward and we have some really great people here. We work with the Bishop all the time and we LOVE their whole family. We actually got to help paint two of their bathrooms this week (you should be so proud of me mom!) 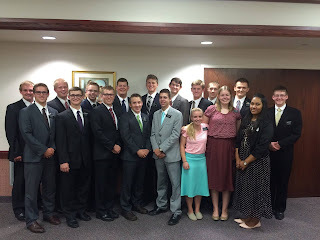 Our ward mission leader helps us with a lot of stuff and the members love the missionaries. Speaking of fun service we also got to help Sister Shultejans (one of my very favorite ward members!) sort through a whole bunch of clothes. She has a lot of clothes that she doesn't need so she has the missionaries help her go through them and then she lets us pick out anything we like! So it was basically shopping and service all at the same time! I go to ward council every week as well as a Book of Mormon class we do every Wednesday for recent converts and anyone who wants to come and we also go to an addiction recovery class every Thursday and that class is basically the light of my life! I LOVE all of the people that come to that class with all my heart. It is basically a class on how to apply the atonement and it is my favorite thing ever. I cover half of the Leesburg ward (the East side). And there are Elders that cover the West side. 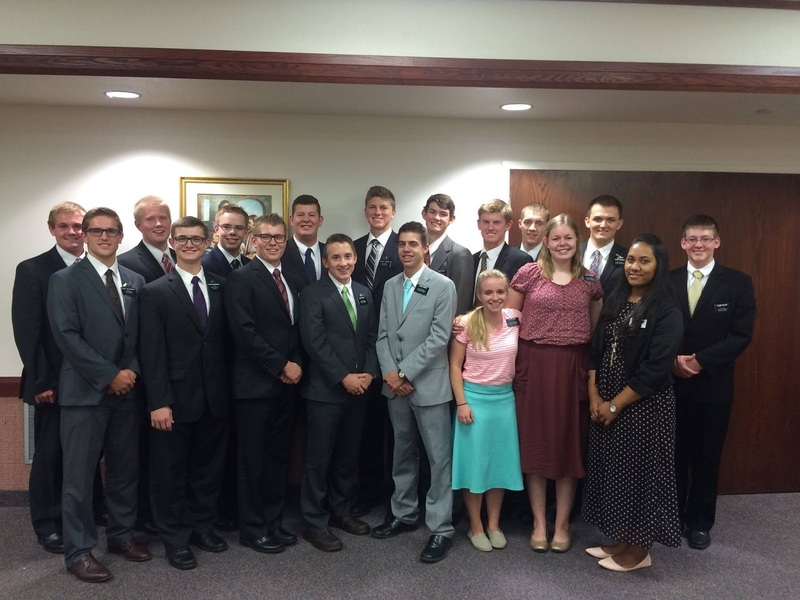 (Elder Thornock and Elder Reschke both from Utah) Elder Thornock is our district leader as well so we work with them a lot. Elder Reschke came out of the MTC with me so he is training too. They are super fun! We had an experience this week where we had felt impressed to share a certain conference talk with a less active member in our ward. After we showed it to her she said it was exactly what she needed. Then at church yesterday she spoke and shared with the ward how she was having a really hard time and that that talk we showed her was a direct answer to her prayer. That experience taught me that if you follow the promptings of the spirit you are doing the Lord's work, and the Lord's work is perfect so if we are listening to Him we have no need to worry about ourselves. I also witnessed a great miracle visiting another part member family this week. We have this part member family that just moved to our ward in April but that hasn't come to church yet. We felt impressed to invite a member of our ward to come with us to this visit. This member has a non-member husband who surprisingly asked if he could tag along (he normally doesn't want anything to do with the church.) The lesson seemed to be going pretty rough. Most of the conversation was steered towards why they all agree that church is weird and why they don't like it and we were having a hard time trying to re-direct it back to positive things. But in the middle of the lesson I had a strong feeling that I needed to testify of the sacrament. So I did and they all agreed that the sacrament was important. The lesson went on and I still didn't feel like it was going well at all but out of nowhere the non-member husband we brought with us looked at the less-active member and said "Let's make a deal... If you come to church I will start coming too." And they both agreed as we all sat in shock as we realized that the non-member was perhaps the best missionary in the room for that lesson. We didn't even have to invite them to church for them to make that deal! It was pretty great! I also learned that the Sacrament is really the biggest reason we go to church and it is in fact the most sacred part of our week if we allow it to be.